You guys, it's FINALLY HERE!! This thing began - as so many things in our little segment of the book blogging world do - with an argument in the comments of Alice's blog about the merits of the Marauder generation and whether Sirius is awful or awesome, and then Megs mentioned that she's never read Harry Potter at all and we SELFLESSLY volunteered to read it with her so we can argue about what she should think. I think that was some time in August, so please behold our follow-through, Universe, and give unto us a brilliant read-a-long, culminating in a meet-up at BEA in May. I'mma tell you right now that I'm a Ravenclaw, always have been, and all you who talk smack about my House because it's suddenly more popular than "brave" Gryffinwhore can eff RIGHT OFF; I've been here since you were all in elementary school. Also I know how to use a semicolon. 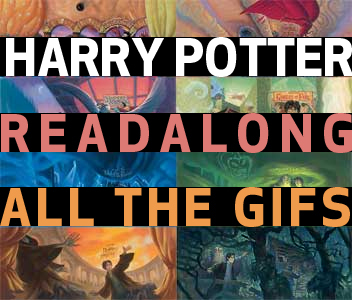 If you need a bit of a kick-start on this or really on anything, you should hang with us on the Internet (shut up we are COOL) on Saturday for a Mini-Read-a-Thon! HP1 totally counts as a) it was written for mini-people and 2) there are goblins in it, which are ALSO mini-people but magical. I hope all of you who are not doing this are prepared for Fridays for the next 5.75 months. We've been trawling tumblr for HP gifs for WEEKS. Looking forward to those Harry Potter gifs! Cheers!